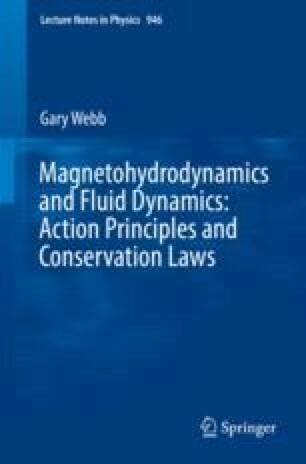 The main aim of this book was to provide an overview of the different techniques used to determine conservation laws in ideal MHD and fluid dynamics. These methods consist of (a) the use of Noether’s two theorems to derive conservation laws; (b) the Lie dragging techniques developed by Tur and Yanovsky (1993) and used by Webb et al. (2014a) and others (e.g. Besse and Frisch (2017)) and (c) the direct method of Anco and Bluman (1997, 2002a,b), Cheviakov (2007, 2014) and Bluman et al. (2010), which consists in determining integrating factors for the equations. This process is in general a computer algebra intensive process. We did not, in fact use the direct method to derive fluid and MHD conservation laws. We illustrated this powerful method of deriving conservation laws, by deriving conservation laws for the KdV equation in Chap. 4. ? derives infinite classes of conservation laws for the incompressible viscous MHD equations using this method.